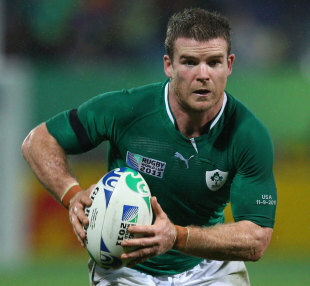 Leinster and Ireland centre Gordon D'Arcy has been rewarded with a new two-year deal. After helping Leinster book a spot in the 2012 Heineken Cup final on Sunday, D'Arcy will hope to remain an integral part of their side over the next two seasons. Slotting in at inside centre, D'Arcy has formed a leathal partnership with Brian O'Driscoll for both club and country. With 68 Ireland caps to his name, D'Arcy will have one eye already set on the 2015 World Cup and his Leinster coach Joe Schmidt is looking forward to working with the centre in the coming years. "Gordon is a born and bred Leinster man and since his debut in 1998 he has been a highly consistent performer for Leinster," Schmidt said. "His competitiveness and ability have had added huge value both on and off the field. We're delighted that Gordon will be extending his long association with his home province and I am confident that he will continue to make a positive impression both on and off the field."